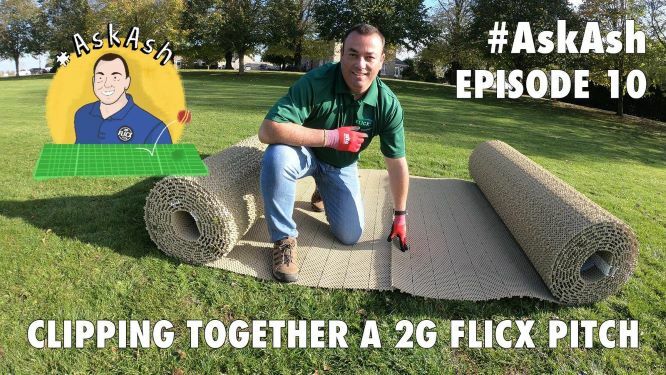 Episode 10 of #AskAsh covers clipping together a 2G Flicx Pitch. A 2G Flicx Pitch is supplied in two half pitch batting ends for ease of transportation and to also give added versatility to the product as the batting ends can be rolled out in the nets, indoors or on the outfield for junior matches. Clipping the zipping the two rolls together is a simple 5 minute job which can be done by one person as Ashley Appleby demonstrates. The video also shows the process for unzipping the pitch after your match or training session. For more detailed installation advice please visit https://flicx.com/case_studies/installation-information-and-guide/ where you can download our installation guide which also comes hard copy with the pitch. Clipping together a 2G Flicx Pitch is a job that can be carried out by one person, although two people makes for lighter work.